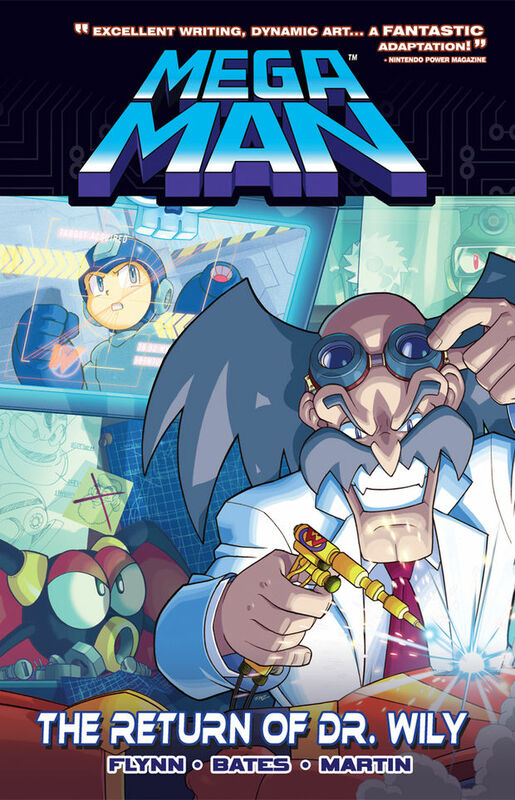 Following the events of Time Keeps Slipping and the creation of eight new Robot Masters, Dr. Wily devises a plan to eliminate Mega Man once and for all. 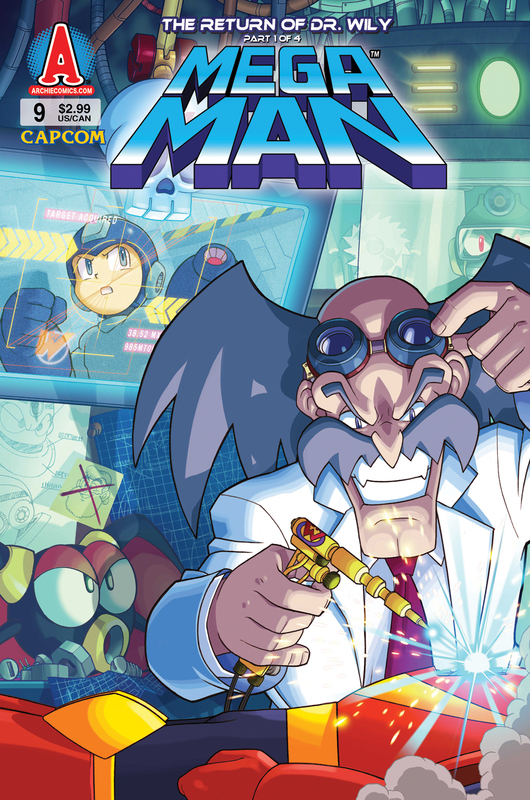 Following the events that take place in Mega Man II for the NES, The Return of Dr. Wily is the best art yet for the comic series, featuring lots of references that game players will enjoy, as well as that signature art style and comedy the Archie staff is known for. With the toughest challenge in front of him, how will Rock handle his new threat? Celebrating the capture of Dr. Wily and stopping his kidnapping scheme, Dr. Light and his robot children Rock and Roll, along with repair bot Auto, make a toast to the retirement of Mega Man, Rock’s robot-blasting alter ego. Before the champagne starts to pour, a new Robot Master appears with a threatening warning for Mega Man. In an all too familiar scene, Rock must suit up in his trusty blue armor to battle a new set of Robot Masters created by Dr. Wily. And these robots weren’t reprogrammed to battle Mega Man like the original eight: these baddies were designed with one goal in mind… destroy Mega Man! – A panel depicting Bubble Man’s stage is lifted directly from Mega Man II, complete with a profile of the stage, Mega Man jumping and battling a Kerog (frog). – While Dr. Light toasts with a can of soda, the robots (Rock, Roll, and Auto) toast with an Energy Tank. This theme or robots drinking Energy Tanks will be repeated throughout the entire series. – Auto jokingly mentions that Wily will show up in his “skull-plane, shooting skull-missiles and takes over the world from his skull castle.” This is a foreshadow of the arc and game Mega Man II. – Roll calls Auto a “Fan-Bot”, a play on the term Fanboy. Auto is the self-titled #1 fan of Mega Man. – Wood Man states that he is made entirely out of wood. Dr. Light confirms this by analyzing his structure and discovering he is made mostly of Japanese Cypress. 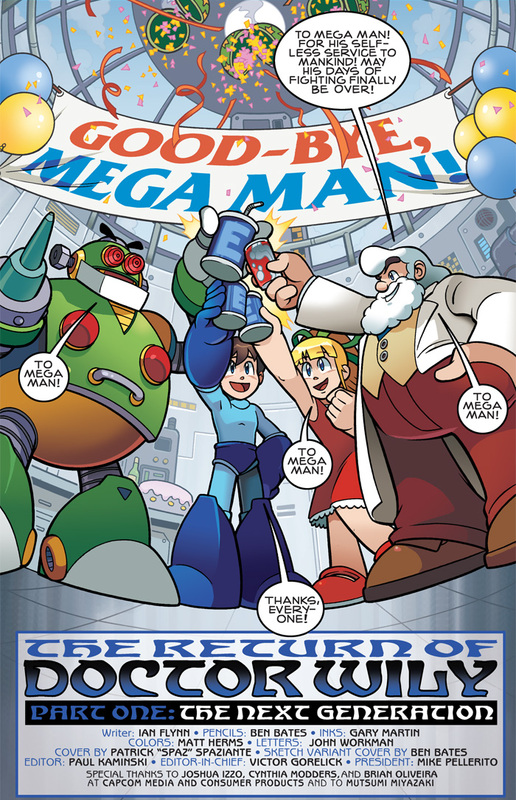 – The title of this story’s arc, “The Return of Dr. Wily”, could be a reference to the first Game Boy Mega Man game, which was subtitled Dr. Wily’s Revenge. 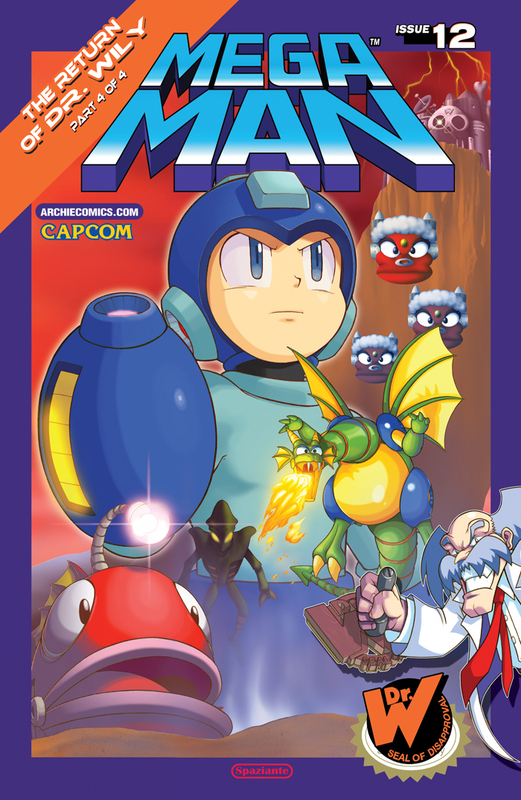 This game includes four Robot Masters from Mega Man (Elec, Ice, Fire, Cut) and four from Mega Man II (Flash, Quick, Bubble, Heat). A toast to defeating Dr. Wily! With time of the essence, Mega Man must push past even more Robot Masters en route to discovering Dr. Wily’s secret location. 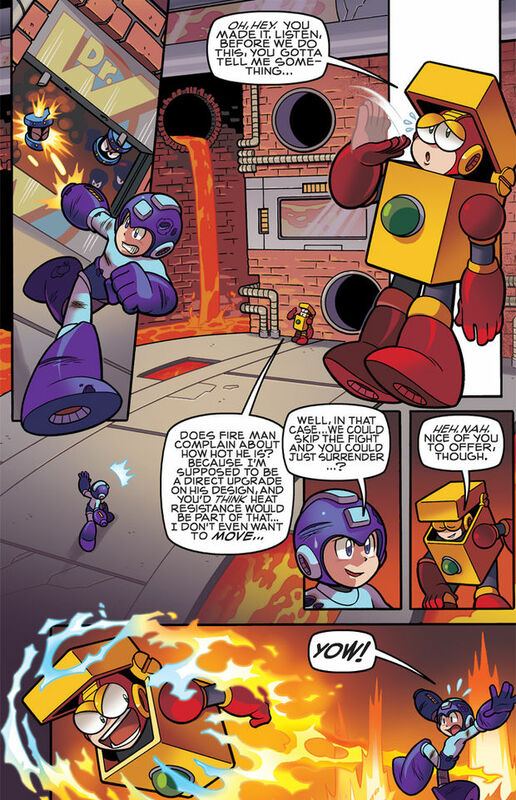 But the more Mega Man battles, the more he seems to grow distant, acting strange and yearning for more battles than one young helper bot should. Dr. Light thinks Wily is up to something, but it may be too late for Dr. Light’s son already! 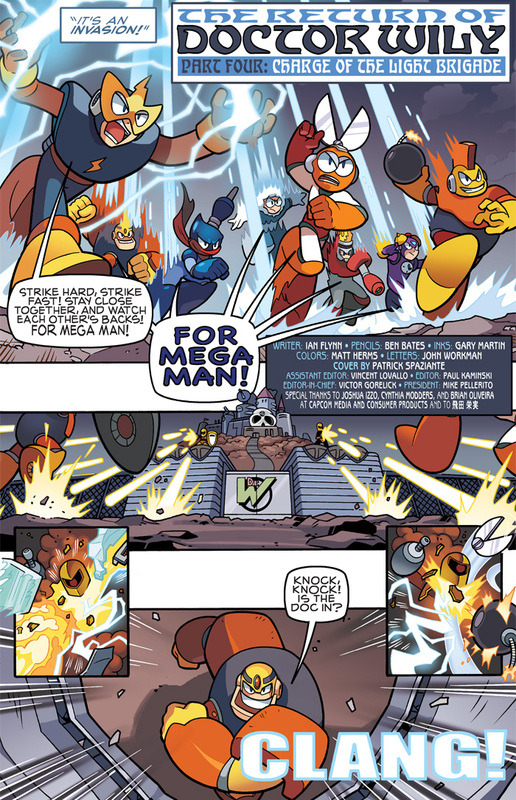 – Quick Man gives a small speech to Mega Man, stating “sequels are rarely as entertaining as the originals. Then again, sometimes they’re superior.” This is a reference to many considering Mega Man II to be a better game than the original Mega Man. – Heat Man’s body is modeled after a flick lighter. He uses this to his advantage in his battle with Mega Man, shutting his top half over his body and avoiding damage from Mega Man’s bullets. Even Heat Man can’t take the heat! Mega Man has finally come fact to face with Quick Man, and after defeating the other seven Robot Masters, he is staged to prevail yet again. But if he does, he’ll fall right into Dr. Wily’s hands, his plan coming to fruition. With no other alternatives, Dr. Light must call upon some old friends to help out their brother in need! – Mega Man chases Quick Man through an exact representation of Quick Man’s stage in Mega Man II, with the one-hit-kills beams firing from the sides. – Mega Man doesn’t fire a single shot in Flash Man’s zone and thus sneaks up on the unsuspecting Flash Man. This is a reference to many games in the series where players can simply bypass most enemies as they progress to the boss’ chamber, not the least of which being Flash Man’s stage, which can be bypassed altogether. – Auto refers to Mega Man as “Blue-and-cyan-with-a-gun-for-a-hand,” a reference to a fan-made song by BrentalFloss. With Mega Man under Dr. Wily’s corruption with a virus and on the opposing side, Dr. Light sends forth the original eight Robot Masters to free Mega Man and stop Wily! Even with their combined force, can they stop the little blue robot that has beaten them all before? Not only that, but Dr. Wily has created one of his vilest robots yet and has unleashed it on the Robot Masters as well. 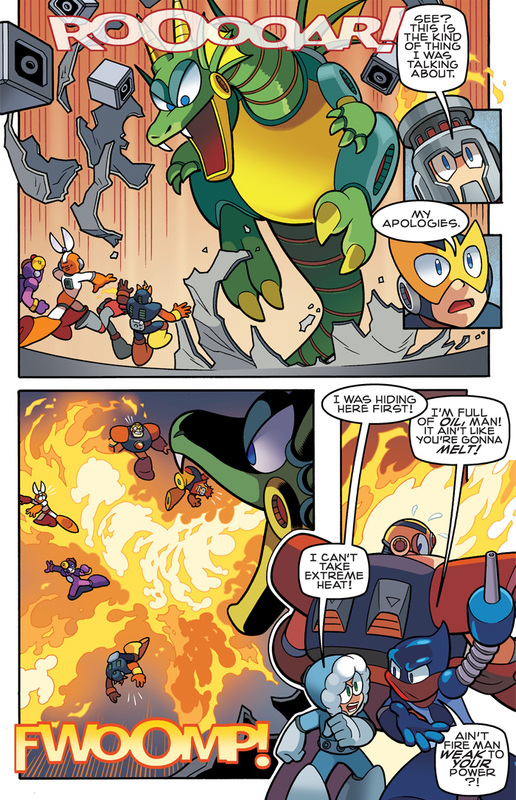 – Both Ice Man and Oil Man hide behind Guts Man to avoid the Mecha Dragon’s fiery breath. They both site their obvious disadvantages to fire in their design as the reason. – After Mega Man sees through Dr. Wily’s Alien illusion, Wily says “Pay no attention to the man behind the hologram,” a reference to the movie The Wizard of Oz. The mighty Mecha Dragon appears! 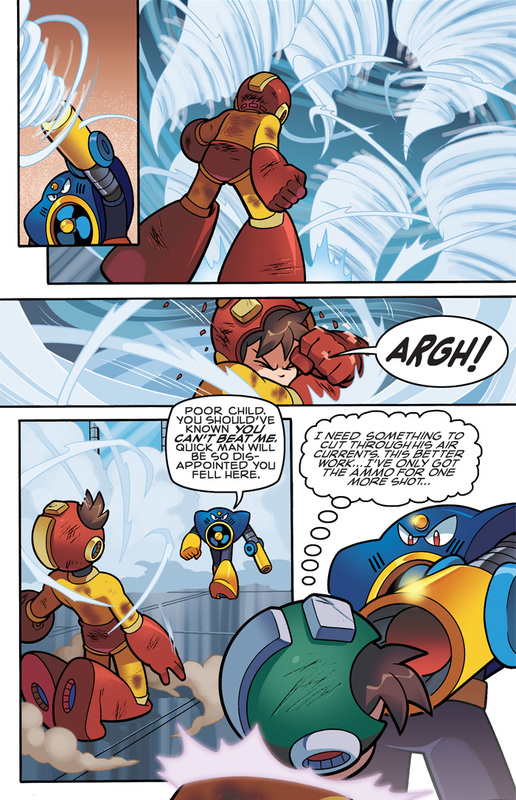 Issue #9: Dr. Light creates a robot hamster to powers itself by running on a wheel, to which Mega Man and Proto Man seem skeptical. Issue #10: Dr. Wily re-purposes his Robot Masters to serve him on vacation. Also has an appearance by Reggae, Dr. Wily’s bird robot. 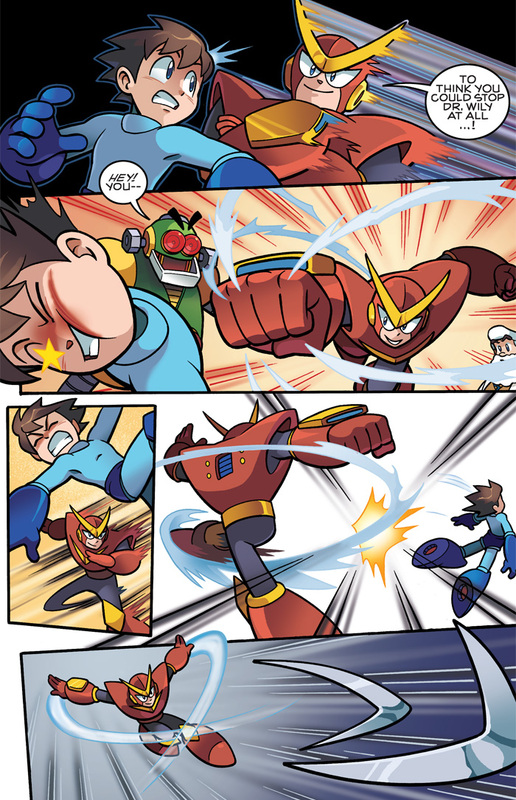 Issue #11: Crash Man is used for more than just defeating Mega Man, putting his name to the test. There are some other extras included in this volume as well. Variant art covers, original sketches of panels, issue scripts and penciled drawings, as well as a Who’s Who section round out an already great package. These extras are just that: extras. They do, however, offer up an interesting look into the world of Archie, and what it takes to make a monthly comic series. 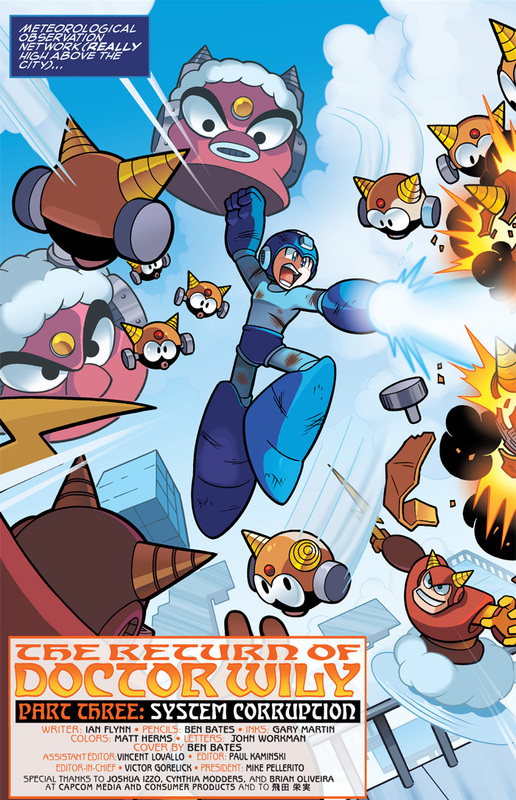 Mega Man Volume 3: The Return of Dr. Wily is the best story yet for the series. The writing was very well done, and kept me engaged throughout. Not only that, but the clever use, dialogue, and fights with the new Robot Masters were very well done. 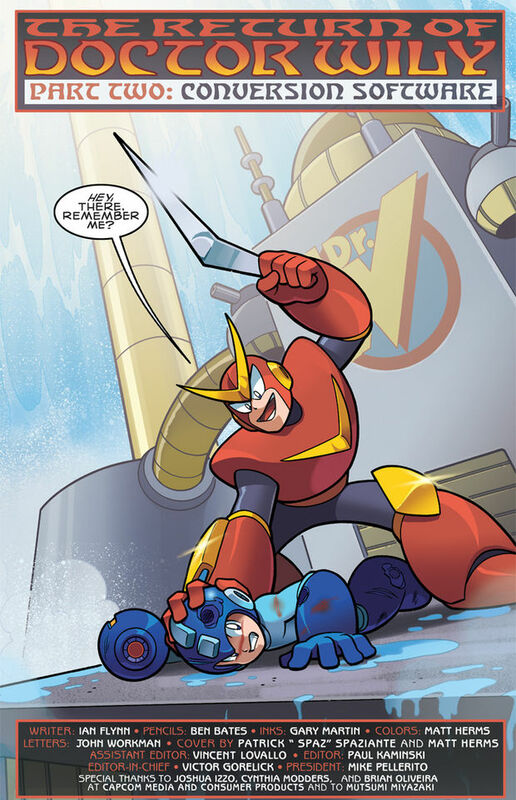 I particularly enjoyed Mega Man’s struggles with Quick Man. Also, I thought there were an especially high number of references to the video games and general Mega Man Fandom this time around. I’m sure I didn’t even catch them all, but when I did pick up on something (like Meta Man being easily defeated by the Metal Blade) I had to stop and chuckle. Kudos to the writers for thoroughly researching all things Mega Man to come up with some interesting pieces to appeal to the fans. 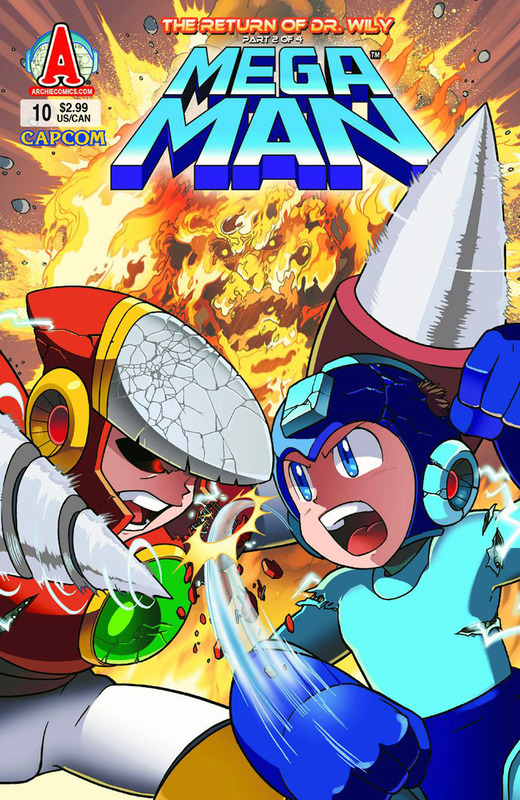 This really is a comic series made for video gamers, and as a huge Mega Man fan myself, I’m excited to see the future of this series. 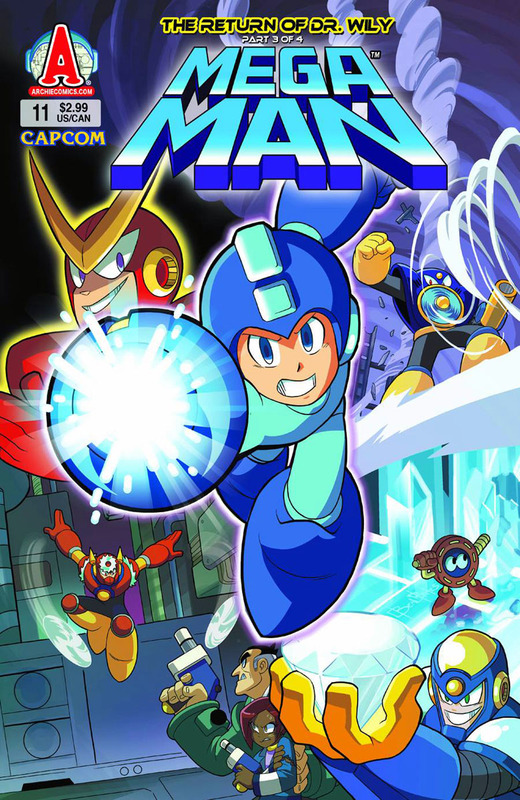 Not only that, but my favorite game in the series, Mega Man III, is (hopefully) going to appear in the comics soon. Buy this graphic novel from Amazon today!